Place quinoa in a fine-mesh strainer and rinse thoroughly with cool water for at least 2 minutes. Drain. Rinsing quinoa before cooking will remove its natural bitter or soapy taste. Transfer to a medium saucepan, cover with stock, cover with a lid and bring to a boil. Reduce heat and cook for 15 minutes on the lowest setting. Turn off the heat and let stand covered for 5 minutes. Fluff with a fork and spread on a baking sheet or large plate to allow quinoa to cool down quickly. Spread almonds in a single layer in a pan and toast over medium-high heat until golden. Watch them carefully as they can burn quickly. Transfer to a large salad bowl. 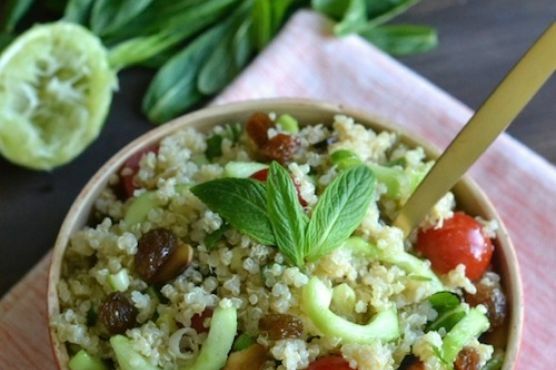 Add cucumber, tomatoes, raisins, scallions, mint and cooled quinoa. Toss to combine. Season with salt and pepper to taste. Drizzle with lime juice and olive oil, and toss again.